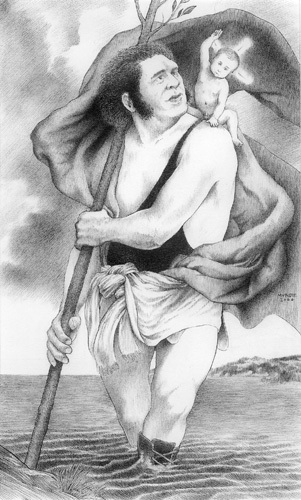 The legend of Saint Christopher quite clearly states that he was a giant. Not just a tall man, but a genuine giant of the beanstalk variety. As the story goes, it was his size that enabled him to easily transport the Christ child across a river and thereby secured his place as patron saint of travelers — that is, until the Church decided that the evidence for Christopher's very existence was entirely legendary and decanonized him. Nonetheless, Christopher remains a popular though unofficial saint, and his image is fixed in our cultural psyche. Christopher's story seemed the ideal vehicle to feature another famous giant — the late Andre Rousimoff, professional wrestler and actor (which amounts to the same thing).